Projects Abroad volunteers often use their own initiative and go outside their expected duties to make a difference at their placements. An example of this dedication was shown by Care volunteers in Vietnam recently. 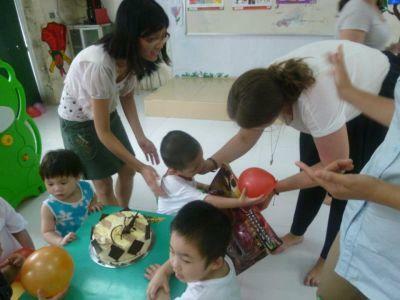 Seven volunteers decided to throw a birthday party for one of the orphans in the kindergarten class at the Bo De placement. The Australian, American, German, British, Canadian and Danish volunteers arranged everything, from buying gifts such as toy cars and superhero figures, to blowing balloons and presenting the children with the birthday cake. The birthday party coincided with one volunteer’s last day working at the project. She was able to leave Vietnam with this special memory of the children to take back home with her. This news story includes references to working in or with orphanages. Find out more about Projects Abroad's current approach to volunteering in orphanages and our focus on community-based care for children.